Prepare skin for shaving with the powerful Clinique for Men Face Scrub. Packed with fine, non-abrasive grains, the scrub exfoliates the skin's surface to remove excess oil, dead skin cells and unblock pores from dirt build-up, revealing a refreshed, refined complexion. Effectively softens skin, lifts facial hair and allows a closer, smoother shave to prevent razor burns and nicks. E.N. Apply to wet face and beard, massage, then rinse. Avoid eye area. Suitable for daily use. 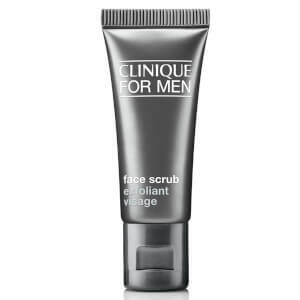 Receive a free Clinique for Men Face Scrub with every Clinique for Men purchase. Gift applied automatically at checkout - no code required. While stocks last.